Win a Hip and Chic Rockin' Baby Sling - Mamanista! We’re advocates of babywearing here on Mamanista and star-gawkers, too, so I was thrilled got the opportunity to review a celeb sling favorite, Rockin’ Baby. 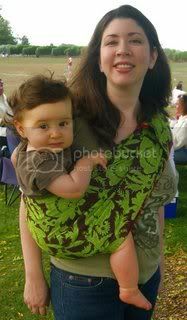 Ring slings allow you to keep baby safe, comfortable, and close while allowing you to have your hands free. Ultra-stylish rock diva and mom, Gwen Stefani, has Rockin’ Baby in her sling stash and with one look at their chic styles you can see why. When I took Rockin’ Baby’s pre-washed “Origin of Love” pouch sling out of the package, I was immediately impressed by the vibrant colors, quality fabric, and hip design. This mom-owned, socially-conscious company also pays all their stitchers fair, living wages. So, the slings look fabulous, and you can feel confident wearing one, but how about the test drive? We’ve reviewed and mentioned dozens of carriers, but I hadn’t tried out a pouch yet. Although I was concerned about getting the close hold I prefer with a pouch, the ingenious design of Rockin’ Baby Pouch allowed me to adjust to the perfect fit. Pouches are just one length of fabric and Rockin’ Baby has a great solution for making the pouch adjustable. Two pairs of zippers allow you to adjust the small/medium sling to fit almost anyone. Just in case, they also carry an extra small (perhaps we’ll see Nicole Richie sporting one soon) and a medium/large. Check out their pouch instructions to see how it works. The pouch is very strong, holding up to 420 lbs, with individual zippers holding up to 130 lbs in tests–but as with most sling manufacturers, Rockin’ Baby suggests only carrying up to a 35 lb toddler. There’s just the right amount of padding to keep the pouch comfortable, even with my heavy baby and my bad back, and you can always insert an extra diaper in the zipper cover for extra padding. I actually found the Rockin’ Baby Pouch design very convenient because you adjust it once and it always fits the way you like it. There’s no fiddling every time I put baby back in and the pouch is always ready to go, a great feature with an active toddler. Baby Diva also gives it her seal of approval, throwing it over her shoulder and wearing it around the house and bringing it to me when she wants to take a stroll outside. Beyond the quality of the construction, what really makes Rockin’ Baby a standout, is their wide range of gorgeous styles. Their slings and pouches are double-sided, so you are getting two hot looks in one. Each style, which ranges from the fabulously beautiful, to the outrageously edgy, is named for a rock hit. With their lush patterns, vibrant solids, and unique bling and embellishments, it is easy to see why Rockin’ Baby Slings are celebrity picks. So, you may not may not be able to hit the clubs and the concerts as often as you used to, but you can still be the hippest parent on the block with Rockin’ Baby. Win a Rockin’ Baby Sling! Rockin’ Baby is originally known for their ring slings and we have the gorgeous “Suffragette City” ($102 value) to give away to one lucky reader. This sling has a sweetly chic sage and pink butterfly pattern on one side and a hot pink fabric with silver trim on the reverse. The fabric is a delicious, breathable, 100% cotton and the ring slings are held to a high standard of safety–each ring must pass an impact test and a 250 pound pull test before being considered ready to ship. Want this to be yours? 1. Link or Share: Contests are more fun when you share! If you are a blogger, link to this post to let your readers know about the contest. If you are not a blogger, fill out this form to share this contest with two friends. If you have trouble with the form, just e-mail two friends the link to this post and Cc mamanista@gmail.com. We will not share your e-mail or your friends’ e-mails with anyone. 2. Comment: Let us know that you linked or shared by leaving a comment below, telling us the name of your favorite style of Rockin’ Baby slings not mentioned in this post. Make sure to include your link or a first name or nickname so we can verify your entry. Make sure you comment AND link or share. Buy Rockin’ Baby Slings Right Now! 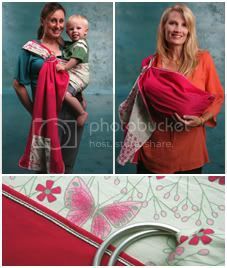 At Rockin’ Baby, most ring slings are $102 and pouch slings are $82, and make sure to also check out their sale items. Discount Coupon Code: Purchase your sling direct from Rockin’ Baby and, after you receive your order confirmation, reply to Rockin’ Baby and let them know you heard about them on Mamanista for 10% off! Mama Luxe is turning 30 so we’re celebrating by giving presents. Check out the rest of our current contests, with more to come on Monday and Tuesday!